From the moment you walk through the doors of The Children’s Dental Practice one notices something different; something unique about this dental office. Children are playing on iPads, PlayStations, and Gameboys, or watching TV from one of the many screens located around the office. Parents are relaxed and calm, some lounging in the reception area while others enjoy the comfortable seating space adjacent to every dental chair in the back office. Laughter can be heard from little patients and dental staff engaged in fun conversations about being at the dentist. Around here, tiny mouths are a HUGE deal! Dr. Ruth Bol has made it her personal mission to help ensure every child that walks through her doors has a positive dental experience. 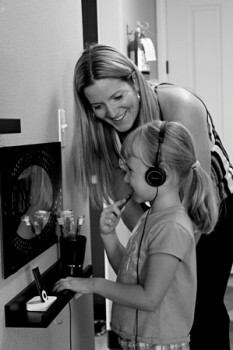 Thus she built The Children’s Dental Practice, with the intention to educate parents on how to approach the topic of “going to the dentist” with their children and create a fun association with the dentist from their very first visit. Many children’s first experience with a dentist happens at an office focused on adult care. Dental care in this environment is often intimidating and frightening for kids. This first impression can create anxiety and avoidance of the dentist that will last a lifetime. Pet Therapy- Deogy, our office Pug acts as a distraction coordinator. She can be found lounging on many patients laps while they are receiving treatment. Positive Distraction- Easy viewing Apple TV’s above all dental chairs which helps keep patients young and old happy and comfortable during their entire visit. IV Sedation/General Anesthesia- Used for children unable to tolerate dental treatment based on extensity of treatment, age, behavior, or special needs. Adult services are now provided at the practice through Kalm, The Dental Oasis. Dr. Bol said the opening of Kalm, The Dental Oasis is due in part to requests from the parents of her juvenile patients for adult treatment. This part of the practice is for adults who want dental treatment with comfort. Dr. Bol uses a level of sedation that is tailored to the patient's level of comfort. "Not many dentists offer sedation these days," Dr. Bol said. "Here, we do everything to make dental treatment a comfortable experience for adults. We offer crowns, cleaning, and all kinds of treatments for people who want the most in comfort in a spa-style environment." In addition to sedation dentistry, the Kalm facility offers Botox treatments to address both pain issues and reverse the effects of aging. Botox injections every three to four months can effectively treat the pain of TMJ (pain in the jaw joint) and migraine headaches. “We believe this is a better method of treatment," she said. "The protein in the Botox stops the muscles from moving. After three or four days, the muscles slowly atrophy in that area. Within two weeks, the patient feels the full effect." Soon, Dr. Bol’s expanded services will include treatment by a new MD on staff to enhance the health of adult patients through hormone therapy, massage therapy, and body sculpting. "It’s not just about teeth anymore," said Dr. Bol about her desire to help patients of all ages receive complete service all in one location. Dr. Ruth Bol and her staff take great pride in being involved with their community and are committed to giving every adult and child the “Kalm Touch” with their ongoing services and care.